We break down heat pump costs by brand, discuss factors affecting cost plus labor and supply cost for installation. What are the best heat pump brands 2019? We explain the different lines of models (basic, better and best) that most brands make and then categorize the brands themselves as budget brands, standard brands and premium brands. What are my heat pump options? You’ll find complete information on heat pump quality, performance, efficiency & size. What’s the right heat pump for my home size and climate? This guide explains choosing heat pump size and efficiency that’s best for your home and climate. This handy navigation guide will help you find what you’re looking for, though if this is your first heat pump decision, reading the entire heat pump buying guide will assist you in making a purchase decision you’re happy with in the years ahead. What Heat Pump Efficiency is Right for You? There are four factors determining heat pump cost, and each is important. For example, two heat pumps that cost $7,500 installed could vary significantly in these four areas. That’s why it’s important to go beyond cost allow to understand these factors. As is the case with most products, central heat pumps are made in a range from budget to premium. Here are your quality options and brands in each category. Brands that have the same parent company and are essentially the same are included within parentheses. Budget brands: Cheap and affordable. 12-16 years of durability: Payne, Aire-Flo, Airtemp, Ameristar, DiamondAir. Standard brands: Mid-priced, good quality. 15-18 years of durability: (Daiking, Goodman, Amana), (Heil, Arcoaire, Day & Night, ComfortMaker, KeepRite and Tempstar), (Armstrong Air and Ducane), (Rheem and Ruud), (Luxaire, York and Coleman), and (Maytag, Broan, Westinghouse, Tappan, Frigidaire, Nordyne and NuTone). Premium brands: Higher priced, excellent quality. 17-22 years of durability. Lennox, (American Standard and Trane) and (Carrier and Bryant). If you dig into who owns the brands, you’ll find that United Technologies (UTC) owns two groups above – It owns Carrier/Bryant in the premium group. UTC also owns International Comfort Products (ICP). ICP makes the group headed by Heil in the standard brands list. The two groups of brands have different product lines. Ingersoll Rand owns American Standard and Trane plus Ameristar, it’s budget brand with a different product lineup. Lennox owns budget brand Aire-Flo that has a different lineup. Daikin, a global HVAC manufacturer, bought Goodman and Amana brands in 2010 to enter the US residential market. Maytag and its sister brands are owned by Nortek Global. Johnson Controls owns York and the others. Basic performance:These are single-stage heat pumps. They’re either on and running at 100% capacity, or they’re off. Basic models are made in efficiency ranges from low to moderate. Better:These are mostly two-stage heat pumps with low capacity of about 65% and high capacity of 100%. They run on low most of the time to boost efficiency and indoor temperature balance. Efficiency in this class of heat pumps ranges from moderate to high. Best:There are two-stage heat pumps and variable-capacity models. Variable capacity heat pumps are also called modulating. They have a compressor that constantly modulates capacity from about 40% to 100%. The purpose is to deliver exactly the right amount of heating or air conditioning to precisely balance temperatures. They are also the most efficient heat pumps available. Not all brands make variable-capacity heat pumps, and they are quite expensive. SEER: Seasonal Energy Efficiency Rating is the measure of air conditioning efficiency. 13 SEER units are the least efficient available in northern states. For southern states, units must be at least 14 SEER. The most efficient heat pumps on the market have ratings of more than 20 SEER. The Lennox XP25, for example, has a 23.5 SEER rating. SEER of about 15-17 is average. HSPF: Heating Season Performance Factor measures heating efficiency. The most efficient models like the Carrier Infinity 20 have HSPF ratings of 13, though most are between 8 and 11. Heat pumps heat at a much lower operating cost than furnaces. The electricity heat pumps use simply circulates refrigerant that captures and moves heat. It doesn’t create heat as electricity does in a space heater or fossil fuel does in a furnace. When you have the choice between a furnace and a heat pump, the heat pump might cost more upfront, but your long-term cost to run it will be 25% to 50% less. Choosing the right efficiency for your climate is discussed below. The smallest heat pumps in any line are either 18,000 BTU (aka 1.5 ton) or 24,000 BTU (2.0 ton). The largest are 60,000 BTU (5.0 ton). The ratings refer to the amount of heat the units move per hour. We’ve broken down heat pump prices in two ways – by brand and by the size of the heat pump. This will give you a more accurate way to estimate the cost of the unit you select. The list below shows the quality level of each brand (Type) and the range of prices from the smallest and least efficient to the largest and most efficient. Brands with a narrow range make a smaller lineup of heat pumps. For example, Aire-Flo makes one model, Airtemp makes two and Payne makes four. All are available in several sizes. A packaged heat pump system is a single large cabinet containing the heat pump and the air handler. In that regard, it is different than a split system with a condensing unit/heat pump outside and the air handler or a furnace indoors. Packaged units are available at efficiency levels up to about 16 SEER. Single-stage and two-stage package units are made. Prices are $500-$1,000 more than split system heat pumps with comparable efficiency and performance. Package units are typically only installed where a standard split system can’t be, such as a home with no basement or crawlspace and no interior room for a utility closet. Package units are not as durable because the entire system is outdoors in the elements. How much does it cost to install a heat pump? Here are standard costs and extras including accessories and supplies. This is the basic installation cost for a replacement heat pump when all accessories and connections are in place and usable. When very old heat pumps are replaced and when a heat pump is being installed in new construction, some of these costs might apply. New Ductwork: New homes and additions require ductwork if a ducted system rather than a ductless mini split system is installed. The cost will be determined by the size of the home, number of stories and quality of the ducting. Condensing unit pad: Your outside unit, the condensing unit, shouldn’t sit on bare ground. Unless it’s being placed on an existing concrete slab, installing a pre-fab pad makes sense. Refrigerant lineset: The two lines in the set circulate refrigerant between the condensing unit and the indoor coil. They’re available in sets from 15’ to 50’. Air handler: The air handler contains the indoor coil that collects heat when air conditioning and disperses it when heating. Coils are sized to match the capacity of the heat pump. The air handler also houses the blower, control board and other electronic components. See our Air Handler Buying Guide for complete information including links to our various Air Handler Brands guides. Thermostat: You’ll need a thermostat for new construction and when replacing a system if the new system has features and performance levels the old system didn’t. The cost of zoning system is typically around $2,000 to $3,300 depending on the number of zones. For more information, read our HVAC Zoning System Cost Guide. Do I Need HVAC UV Lights? Are They Worth the Money? Dehumidifier for HVAC System? Is That Worth the Money? Humidifier for HVAC System? Is That Worth the Money? Do I Need an Air Purifier Add-on for HVAC System? Is it Worth the Money? Heat pump size is an essential part of the equation as you decide on your next heat pump system. The shortcomings of a system that is too small are obvious. It won’t get the job done and will wear out quickly while trying. A heat pump that is too large will waste energy and cause noticeable temperature swings. They sometimes have a short-cycling problem that leads to mechanical failure. HVAC professionals use a Manual J load test and similar methods to determine the best fit for any home. However, you can make a pretty accurate estimate using the information here. First, find your location on this US Climate Zone map. The hotter or colder your climate is, the larger the unit will need to be per the square footage of your home. Zones 1 & 2 (hot) and Zone 7 (very cold): 22-30 BTU/sq. ft. Zone 3 (warm) and Zone 6 (cold): 20-24 BTU/sq. ft. Zone 4 (moderate) and Zone 5 (cool): 16-22 BTU/sq. ft. Note: In Zones 6 and 7, the coldest zones, a system with an efficient gas furnace and small central air conditioner is also a good option. It’s not just your home’s size and climate that are considered. Your home’s construction is considered too. Home’s with energy-efficient materials and insulation levels need fewer BTUs per square foot than poorly constructed homes. Is your home more efficient than it used to be?If you’ve upgraded your home’s energy efficiency (additional insulation, insulated doors, windows or siding, weather stripping, etc. ), then the replacement heat pump should probably be smaller than the old heat pump. Heat pumps and freezing weather:Standard heat pumps are not a great fit for very cold climates, at least in the dead of winter when temperatures regularly drop (or stay) below freezing. However, they do have lower operating costs than gas furnaces, so they are still worth considering even in very cold climates for use when temperatures are chilly but not bitter cold. They can be included in a dual fuel system that includes a gas furnace for heating when it’s freezing outside. Dual fuel details are below. Breaking down efficiency into three categories with factors for each will help you decide how efficient your next heat pump should be. You live in a very temperate climate without extremes. Dry, moderate climates like the San Diego area and other small parts of Zones 3 & 4 are rare. You plan to move in the next few years, so don’t want to spend a lot on a heat pump, and you are not concerned about how the efficiency of the heat pump might affect your home’s potential to sell. You live in Zones 3, 4 or 5. You live in one of those few temperate zones, so efficiency isn’t so important, but you want a two-stage heat pump or one that will be more attractive to energy-conscious home shopper. You plan to live in your current home indefinitely and are willing to pay more for an efficient heat pump that will pay you back through lower utility bills. 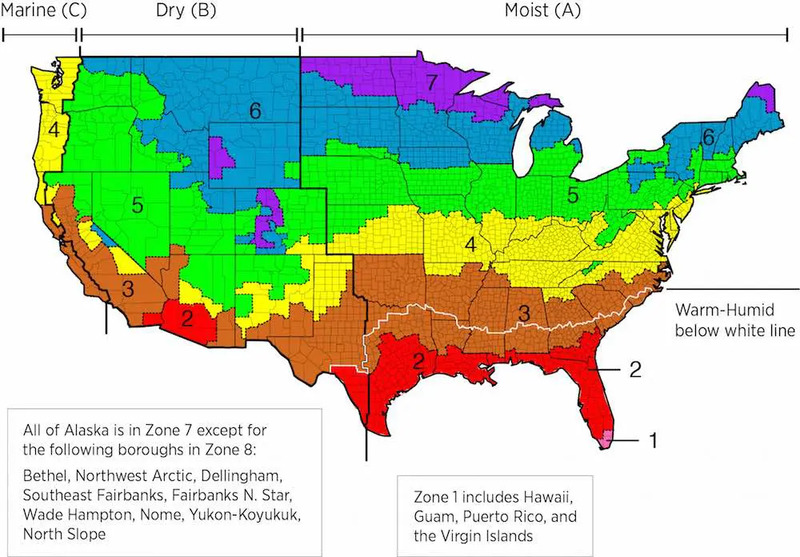 You live in Zones 1, 2, 6 or 7 (and Zone 5 areas where summer humidity is very high). Regardless of where you live, you’re committed to the most environmentally responsible heating and cooling available. You want the performance of an efficient two-stage or variable-capacity heat pump. Energy rebates and credits are available from most energy suppliers nationwide for homeowners that install moderately to highly efficient equipment. Call your energy provider or see its website for details. You’ll find additional information at DsireUSA.org. Dual Fuel Heat Pumps and Cold Climate Heat Pumps. If you want the operating cost and environmental benefits of efficient heating when temps are above freezing, consider a dual fuel or cold climate heat pump system. Standard split system: This system includes a heat pump and an air handler. The heat pump does the primary heating. The air handler is often equipped with electric heating units ranging from 5kw to 25kw. Like a space heater, these backup heating units use electric resistance heat that is significantly more expensive to create than gas furnace heat. Their purpose is to boost heating in bitter cold or as emergency heat when the heat pump fails mechanically. Dual fuel split system: This system includes a heat pump and a gas or oil furnace: The most common operation is to have the heat pump do all the heating when temperatures are above freezing. The furnace blower moves the warm air, just as it does when the furnace is also making the heat. The system can be set to automatically shift to the furnace for heating in extreme cold and back again when temperatures warm up. The temperature the switch takes place can be adjusted to the setting you prefer. You can read more in our dual fuel heat pump buying guide. Cold climate heat pumps: The most efficient air source heat pumps qualify for a new categorization called cold climate air source heat pumps (ccASHP). To meet the criteria, they must have an HSPF rating of at least 10 and a coefficient of performance (COP) of 1.75 or greater at a temperature of 5 degrees Fahrenheit. This means they produce 1.75 times the heat that would be produced through resistance heat or a gas furnace that was 100% efficient. Currently the most efficient gas furnaces are about 98% efficient. In moderate weather, the COP of heat pumps is 3.0 to 5.0. Some of the current models that qualify as ccASHPs are the Amana AVZC20/Daikin DZ20, American Standard AccuComfort Platinum 20/Trane TruComfort XV20i, Lennox XP20, Bryant Evolution Extreme 280A/Carrier Infinity 20, Maytag PSH4 and identical units from sister brands. Many cold climate heat pumps can also be included in dual fuel systems to further reduce heating costs in the very coldest weather. Warning：Before you dive into brands reviews, we strongly recommend you spend 70% of your research time on finding a qualified contractor. Heat Pump is not a traditional appliance and most brands are reliable. We have got some complaints and reviews about each brand for the constant problem for compressor broken, freon leaking, and weird noise etc. Actually 80% of these problems are caused by the improper installation instead of bad brands. You will always get what you paid for the installation work. So never drastically decrease your installation budget for any case and remember to compare at least 3-4 contractors’ install fee. If you have a limited budget, you can choose some economical brands like Ruud, Goodman and Rheem etc instead of choose “economical” installation. Logterman LLC Htg & Cooling in Delavan, WI. quoted me this for heat pump installation only. No additional work needed on closed loop system. Seems a bit high, any comments? I took advantage of a spring sale and bought this heat pump. I also decided to have the ventilation system fixed. In addition, I decided to throw in a new air filter system. This was a precautionary move, to ensure I got the full benefits of the system. The performance by the workers was quite impressive; they completed all the work in just a day. So far so good, I have had the system running for five years now. It has helped to cut down my utility bills. Freeing up money for many other projects. This purchase was a replacement for an old Trane system, which has been running for fifteen years. Due to the reliable service form the previous system, we had no qualms about installing another one. It has been two years and the system is still working perfectly. I had always heard about Rheem heat pumps and how great they were, so I decided to test one. It has been four years now, since I installed the heat pump. With an average of $100 savings each year. This is a great investment to continue using the system for many years to come. My last heat pump started giving me grief, only a year after installations. I decided to overhaul the entire system after the fifth repair in just one year. So far, it has been good, I cannot think of anything more that I would want from a heat pump that Rheem does not have. This was a replacement for an old system. Everyone in the house agrees that this is one of the most quite heat pumps. The system produces about 80% less noise than any other system I know of. Could not have asked for a better system. The system has been retrofitted into a Carrier system that is propane-fired. The results have been astounding. In just three months, it only used up 2,300 Kwh. It is important to watch out for air leaks to ensure a high level of heating efficiency. We have had this heat pump running for the last five years. During which, it has provided reliable service. The option to control temperature and humidity was quite awesome. This feature is quite useful; those who live in Florida understand what I mean. In addition, the contractor was great and did a good job at installing the system. It has been running quietly for the past five years now. It is definitely quieter than our last system. I was replacing an old system of a home I moved into a few years ago. I have had many good things about the godman heat pump, so I decided to try it out myself. The system is generally reliable and runs quietly, a plus for any system. After two years, the system is still responsive and offers exactly what I expect. I replaced my old HVAC system with the York LX. For the past one year, it has continued to run perfectly, without any issues. I should point out that the cost is inclusive of upgrades in the heat duct systems. In addition, I paid extra for ten-year maintenance and parts replacement. The heat pump has continued to give us reliable service for over seven years. Anyone who may dissatisfied with the product, may be due to using shady contractors. Make sure to use company-certified installers to get value for money. I replaced a Trane, which I had been using for 15 years. So far, the system has no issues and problems after three years of use. In addition, it does not consume as much power as some other heat pumps of the same size. This table is based on local customers feedback and online submitted information, we will update this table every 3-6 months to keep this up to date. If you want to share you previous Price details to help homeowners to make a better decision, click here to submit it or just leave a comment. Firstly, keep in mind that installation quality is always the most important thing for residential HVAC project. So never sacrifice contractor quality for lower price. Secondly, remember to look up the latest tax credit and rebates as we talked above. Thirdly, ask for at least 3 bids before you make the decision. You can click here to get 3 free estimates for your local contractor, and this estimate already takes rebates and tax credit into consideration and filter unqualified contractors automatically. Lastly, once you chose the right contractor, remember to use the tactics from this guide: Homeowners Tactics When Negotiating with HVAC Dealer to get the final best price. Do you live in the cold climate area and looking for dual fuel heat pump? See our Dual Fuel Heat Pump Buying Guide or HVAC Systems Types for complete information on supplementary heating. Probably because they are chasing/taking advantage of the rebates many states offer homeowners to buy and have installed these pumps. Glad I found your website. Just in time to replace my current system. WOW, it takes a lot to impress me. Anyone looking to buy a Heat Pump or just needing to stay informed needs to know about this website. WOW!!! Great information. Thanks for compiling it. Can you tell me what year the real world prices were collected? Interested in Alexandria in particular. I asked for 3 bids for 3 ton Ruud 14 seer heat pump condenser and a-coil in Newcastle, OK. Highest price was $6500, next was $3,800 from a Ruud dealer, ended up with a 5 star company for $3,550. My 18 year old Ruud heat pump went bad and had way higher electric kwph bills. Was happy with using a lot less expensive electric bill. Not happy with paying so much more than others on this website. Lots of helpful info here. Thank you! Great information! I’m getting educated so we can make an informed decision when we replace our 16 year old heat pump in a few months. Installed Amana 16 SEER condenser only, 12/11/2018. Wonderful information Thanks very much!! I am trying to decide between them. They make central ducted heat pump which includes a high pressure static (0.8″ w.g.) fan that can heat a full house through ducts. I don’t have/want a furnace so I was planning to add some ducts to my house and remove most of my baseboard electric heater. Heat Pump Blowing Cold Air – Why Is My Heat Pump Not Heating?